T he inquiry into revenue streams for extremist groups was commissioned by David Cameron when he was prime minister and is thought to focus on Saudi Arabia. Corbyn referenced May’s speech after the London Bridge attack on Saturday, in which she said challenging terrorism would require some difficult and often embarrassing conversations. In a speech that also criticised May for ignoring warnings about the impact of police cuts, he said: Yes, we do need to have some difficult conversations, starting with Saudi Arabia and other Gulf states that have funded and fuelled extremist ideology. It is no good Theresa May suppressing a report into the foreign funding of extremist groups. We have to get serious about cutting off the funding to these terror networks, including Isis here and in the Middle East. The Liberal Democrat foreign affairs spokesman, Tom Brake, wrote to May last week asking her to commit to not shelving the report. Writing in the Guardian on Monday, the Lib Dem leader, Tim Farron, said it was essential the report was not suppressed. Theresa May now has a choice. Does she publish that report or keep it hidden? Farron said. Theresa May talks of the need to have some difficult and sometimes embarrassing conversations. That should include exposing and rooting out the source funding of terror, even it means difficult and embarrassing conversations with those like Saudi Arabia that the government claims are our allies. 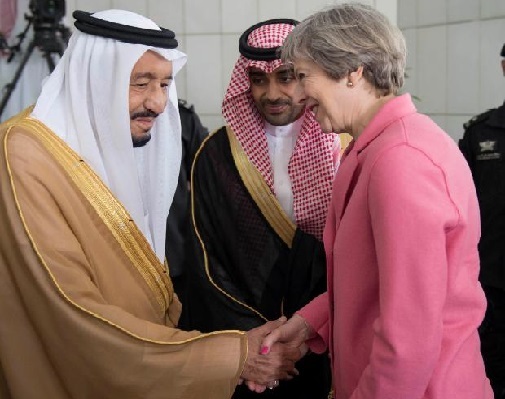 The Conservatives were criticised last year for selling billions of pounds of arms to the Saudis. Cameron ordered the investigation as part of a deal with the Lib Dems in exchange for the party supporting the extension of British airstrikes against Islamic State into Syria in December 2015. The Home Office’s extremism analysis unit was directed by Downing Street in January 2016 to investigate overseas funding of extremist groups in the UK, with findings to be shown to the then home secretary May and Cameron. Eighteen months on, the Home Office said the report, originally due to be published in spring 2016, had not yet been completed and publication was not guaranteed, given the sensitive nature of the content. A decision about the future of the investigation would be taken after the election by the next government, a Home Office spokesman said.